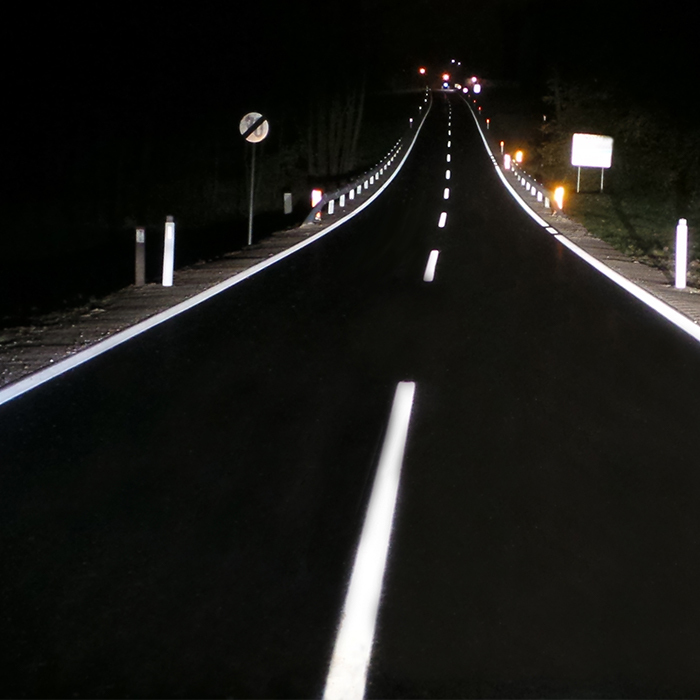 Horizontal road marking systems consist of paints and glass beads. In a „symbiotic” relationship, the paint layer furnishes the desired colour, surface for retroreflection (RL), and retains the glass beads, while appropriately embedded glass beads provide RL and simultaneously protect the paint. The performance of road markings plays quite an essential role when it comes to visibility, mobility scenarios such as smart driving and autonomous vehicles. Ensuring potential reduction of accidents and saving lives requires a minimum intervention policy. The European Road Federation recently proposed the 150x150 formula to maintain at all times RL>150 mcd/m²/lx and RW>35 mcd/m²/lx, (at present, in majority of cases drop of RL to 100 mcd/m²/lx is permitted). The capability of SOLIDPLUS in combination with waterborne paint W16 was tested in a side-by-side experiment with standard glass beads. Transverse lines, width of 15 cm, were applied at a road with Average Daily Traffic (ADT) of 7346 vehicles (including about 8% articulated lorries).After a winter exposure (0.6 million vehicle passes), the results were excellent: RL losses were only minor and both evaluated systems passed easily. After one-year (over 1.4 million vehicle passes), a further drop in RL expectedly occurred. However, SOLIDPLUS beads were still providing RL exceeding 450 mcd/m²/lx. Data extrapolation to predict a failure point has shown that road marking systems with SOLIDPLUS glass beads were employed only at 40% of its useful life. in lower initial RW, but also a failure occurred within only 0.4 million vehicle passes. One must keep in mind here that for Type II markings designed to meet RW requirements, glass beads with diameters up to 1400 µm are typically used, whereas in this trial beads up to only 800 µm were used. Additional retroreflectivity and durability can benefit the applicators seeking to fulfil the minimum RL requirement for performance contracts. Several scientific reports prove that increased RL is leading to lowering the number of accidents; hence, the use of SOLIDPLUS glass beads ought to increase road safety. Furthermore, it was found that elderly focus on retroreflectivity while driving in darkness, so markings with very high RL would augment their mobility. Retroreflectivity (RL) achieved with standard and SOLIDPLUS glass beads during road test. Wet night retroreflectivity (RW) achieved with SWARCOFLEX and SOLIDPLUS glass beads during road test.